On the giant coffee table in the hotel room there’s a bowl containing fruits that might not be familiar: Rambutan, Mangosteen, Durian, Custard-apple, Pomelo, Lichee. From my window on the 37th floor Bangkok is all atmosphere. In the pollution it’s barely possible to see the street below. Even the unbelievable traffic seems muffled by it. The late afternoon sun glints from the wings of jets as they silently float between distant buildings on their way into Don Muang Airport. Earlier today I visited with 18 year old Phunnee Sulalongporn. Phunnee is from the north of Thailand. She has come here to be among the bright lights. She works in a room about the size of a closet. Like her father and her grandfather before her, she works in lac. Phunnee does her lacquer work in an ancient Siamese method. Lac is the collected excretions of a particular insect Coccus lacca. It comes from the twigs of trees on her ancestral farm. First she builds her vases and betel boxes from horsehair and thin bamboo strips. It’s something like building a thatched teacup out of toothpicks. Then she paints her construction with penetrating treacle of lacquer thickened with clay. After a week of drying the object is scraped and polished to an even thickness. One layer of lacquer after the other is applied to make a glasslike and iridescent surface. Most of her objects are varied shades of red. With her tiny, elegant hands, she shows me how they must sit perfectly straight, how her lids must fit, how the surface must be even and free of dust. Everything is light, delicate, fragile. Esoterica: Lac, shellac, lacquer and cochineal are all related to one another. In their original and pure form they make a complex variety of products including dyestuffs and waxes that have been used in Eastern arts for more than 3000 years. Your letter left me both a little sad and a little happy. Happy for you being able to travel the world and see such beautiful art objects and how they are traditionally made, and sad for the artist in that tiny little room closeted for 12 hours a day doing exquisite work passed down for generations. While we pay a lot of money for these treasures, what does she earn for her talent, and a hard 12 hour day? Perhaps, some satisfaction in perfection. Your letter was, as usual, on more than one level. A nice insightinto an ancient and little-known art form. A surprise to find ourselves, with you, experiencing something new. But more than that the question about the fruits of civilizations. The civilization of the West can give the “plastic” radio, or even the “plastic” teacup or pill bottle that so cheaply apes the time-honored lacquer. Then there’s the life-killing pollution. And lastly, the reference to the English drivel that appears on the clothing and other belongings of so many third-world peoples. It’s all too bad. I have made a black lacquer finish for frames to simulate the piano finish or oriental lacquer trying to get the look of old Dutch frames. I used a black car lacquer with a red car lacquer layer underneath then polished it with rotten-stone in between layers. I’ve also tried oil glazes. They come out sort of similar to that finish though not as nice. I wondered if you could find out what they use for that sort of finish? Maybe it’s a secret? You can’t get anyone of us who know about durian to believe that anyone would put something that stinky in a fruit bowl arrangement — even in the markets in Chinatown, it’s displayed frozen to keep the natural aroma of the fruit at bay. It smells really, really bad. Once prepared, it’s delicious, but those who smell it “in the raw” generally need to be convinced. On the other hand, I’d love to meet lychee in its fresh state, as opposed to in the can, or jellied. (RG note) Like a lot of things in life, the durian does not emit its true nature while it’s still in its hard shell. My art is also very hard and a specialty. I work in gouache, watercolor and traditional colors, also walnut extract, gold, saffron, mineral stones and everything that there is in nature. I make my own white color for my paintings. 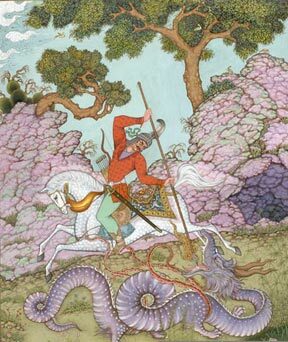 Miniature is current in the Eastern world, especially, as there are different methods in Iran. I work until midnight but I only produce perhaps 5 or 6 paintings each year, for example: Goshtasb War tableau took 8 months time and I work very hard with indefatigably. Eileen Gray (1878-1976) was an Irish woman who discovered lacquer work for herself here in Paris in 1906. She at first studied under the Japanese master Sougawara. She was to become over many decades one of the finest Western lacquer artists. Gray was also a creative designer and architect, although her extant works are few. She is buried in the Pere Lachaise cemetery. My thoughts on using this approach with painting — it would be really hard to ignore painterly quality, but maybe rapid-fire execution of, say, 90 paintings in 30 days would yield some surprises. A book I just finished on how to improve one’s brainpower also recommends speeding up activities to improve concentration and mental organization. (I’ve Forgotten Everything I Learned In School by Marilyn Vos Savant) On the other hand, I hate producing bad paintings for the sake of producing paintings. I work at Artnet.com and assist the artists in posting their portfolios online with us. One of our artists forwarded your recent survey to us. I think you did a very good job and it is nice that you compile this type of information. One thing I want to do is explain how you can have more information about yourself on Artnet.com. The reason you appear on Artnet.com at this time, is because your gallery, namely Westbridge Fine Art Ltd., has a site with us in which they chose to include an image by you. Essentially, the galleries that have sites with us typically list the artists represented and/or artist inventory, and of those names, the gallery will choose to show works online by some of their artists. It is actually up to the gallery to submit biographical or other information to us to add to the site. In this instance, if you ask Westbridge to supply us with your biographical information and make it accessible from their site and in general on your behalf, we will certainly add the information in. From time to time I do have artists contact me directly asking how they can have more information included on them and I explain that they must have the gallery that possesses the website contact us with such information asking us to add it in. The other option for artists on Artnet.com is to establish an independent artist portfolio, where you as an artist take out your own website with us (listed under our Artists’ Portfolios section of the site), but where your name will also appear in the main artist index just like gallery website artists. Many artists choose to do this since they have the freedom to add as many images and as much text as they would like about themselves. Even where they have representation, many artists like to do this since you can show more — it’s like having your own site where you can still list your gallery and include links to any other websites if you wish. I would be happy to speak with you more about Artnet.com’s benefits and services and answer any other questions you may have — please feel free to e-mail me — and I hope this helps! You had me panicked with the title of a clickback a while back. Goodbye, it said. (October 16, 2001) I thought you were leaving me! I felt the panic rise, what must have happened? Why would you stop these wonderful letters? What would I do without the twice-weekly glimpses into the studios, experiences and thoughts of this wonderful worldwide artist community? Well, it would be my fault anyway, I have been ignoring you for a while, passing you over for other more immediate and commercial matters. The times I meant to write something, to join in and be a ‘real’ artist like the rest of your subscribers, what’s this?, oh phew!!! It’s just a title referring to the end of a workshop, Robert you really had me worried! So, I’m writing this to let you know how much I value your letter as a learning tool and support system. You have been with me through many transitions in my artistic path, from hesitant amateur to an increasingly confident and successful full time painter. I have drawn ideas and comfort from the writings that arrive in my mailbox each week. Friends that I have introduced to your world have subscribed and contributed clickbacks straight away when somehow I did not feel ready to join in, until now. So, it’s hello not goodbye! I just wanted you all to know I am here and am happy you are still here too.